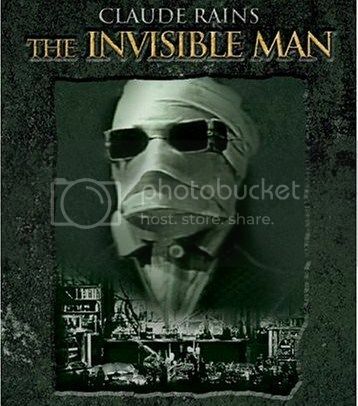 The Invisible Man is one of my favorite movies ever. It's cool not only because he cannot be seen by others, but also because when he speaks nobody listens. That is too much! Great film and so well played by Claude Rains, no one matched up to that performance. pity he plunged into obscurity. Sir John Gielgud once remarked about him, "He was a great influence on me. I don't know what happened to him. I think he failed and went to America". Sad story really, even his one time lover had a dig at him when she said "Claude Rains was what we call an actor's actor. Basically, he was very involved with himself and his performance." Great film and so well played by Claude Rains, no one matched up to that performance. pity he plunged into obscurity. Sir John Gielgud once remarked about him, "He was a great influence on me. I don't know what happened to him. I think he failed and went to America". "Claude Rains was what we call an actor's actor. Basically, he was very involved with himself and his performance." Claude Rains was a favorite of mine in many great movies including The Wolf Man with Lon Chaney Jr.
His performance in the original Invisble Man was as amazing as the story itself. invisibility while conducting a series of tests involving an obscure drug called "monocane". I wonder if Monocane is a real substance like Cocaine?